← How an average student became Mahatma Gandhi? 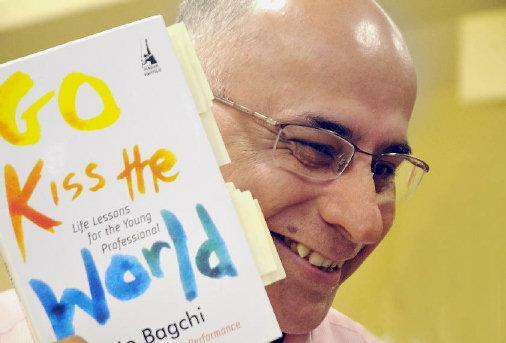 Inspiring Story of Subroto Bagchi, MindTree CEO – ‘Go Kiss the World’. Our day used to start with the family huddling around my Mother’s chulha – an earthen fire place she would build at each place of posting where she would cook for the family. There was no gas, nor electrical stoves. The morning routine started with tea. As the brew was served, Father would ask us to read aloud the editorial page of The Statesman’s ‘muffosil’ edition – delivered one day late. We did not understand much of what we were reading. But the ritual was meant for us to know that the world was larger than Koraput district and the English I speak today, despite having studied in an Oriya medium school, has to do with that routine. After reading the newspaper aloud, we were told to fold it neatly. Father taught us a simple lesson. He used to say, “You should leave your newspaper and your toilet, the way you expect to find it”. That lesson was about showing consideration to others. Business begins and ends with that simple precept. Government houses seldom came with fences. Mother and I collected twigs and built a small fence. After lunch, my Mother would never sleep. She would take her kitchen utensils and with those she and I would dig the rocky, white ant infested surrounding. We planted flowering bushes. The white ants destroyed them. My mother brought ash from her chulha and mixed it in the earth and we planted the seedlings all over again. This time, they bloomed. At that time, my father’s transfer order came. A few neighbors told my mother why she was taking so much pain to beautify a government house, why she was planting seeds that would only benefit the next occupant. My mother replied that it did not matter to her that she would not see the flowers in full bloom. She said, “I have to create a bloom in a desert and whenever I am given a new place, I must leave it more beautiful than what I had inherited”. That was my first lesson in success. It is not about what you create for yourself, it is what you leave behind that defines success. My mother began developing a cataract in her eyes when I was very small. At that time, the eldest among my brothers got a teaching job at the University in Bhubaneswar and had to prepare for the civil services examination. So, it was decided that my Mother would move to cook for him and, as her appendage, I had to move too. For the first time in my life, I saw electricity in homes and water coming out of a tap. It was around 1965 and the country was going to war with Pakistan. My mother was having problems reading and in any case, being Bengali, she did not know the Oriya script. So, in addition to my daily chores, my job was to read her the local newspaper – end to end. That created in me a sense of connectedness with a larger world. I began taking interest in many different things. While reading out news about the war, I felt that I was fighting the war myself. She and I discussed the daily news and built a bond with the larger universe. In it, we became part of a larger reality. Till date, I measure my success in terms of that sense of larger connectedness. Over the next few years, my mother’s eyesight dimmed but in me she created a larger vision, a vision with which I continue to see the world and, I sense, through my eyes, she was seeing too. As the next few years unfolded, her vision deteriorated and she was operated for cataract. I remember, when she returned after her operation and she saw my face clearly for the first time, she was astonished. She said, “Oh my God, I did not know you were so fair”. I remain mighty pleased with that adulation even till date. Within weeks of getting her sight back, she developed a corneal ulcer and, overnight, became blind in both eyes. That was 1969. She died in 2002. In all those 32 years of living with blindness, she never complained about her fate even once. Curious to know what she saw with blind eyes, I asked her once if she sees darkness. She replied, “No, I do not see darkness. I only see light even with my eyes closed”. Until she was eighty years of age, she did her morning yoga everyday, swept her own room and washed her own clothes. To me, success is about the sense of independence; it is about not seeing the world but seeing the light. He was a man whose success was defined by his principles, his frugality, his universalism and his sense of inclusion. Above all, he taught me that success is your ability to rise above your discomfort, whatever may be your current state. You can, if you want, raise your consciousness above your immediate surroundings. Success is not about building material comforts – the transistor that he never could buy or the house that he never owned. His success was about the legacy he left, the mimetic continuity of his ideals that grew beyond the smallness of a ill-paid, unrecognized government servant’s world. As told by Subroto Bagchi. This entry was posted in Uncategorized and tagged CEO, Go Kiss the World, great achievement, Great speech, Mind Tree, motivation, Must read success secrets, rags to riches, Subroto Bagchi, success story of indian business leader. Bookmark the permalink. 3 Responses to Inspiring Story of Subroto Bagchi, MindTree CEO – ‘Go Kiss the World’. I have been a regular reader of changeminds by my friend, A.Hari. This post by Subroto Bagchi brought tears to my eyes, not only because of the story itself, but because I could identify myself in the narration, and could think back of my parents.My father too, was a govt servant(Police service)and never once did he take his children in his jeep. My brothers would be walking about 5 kms to school, and they would proudly say to their friends,”That’s our father” when they saw the jeep pass by, and the friends would make fun, saying,”If he was really your father, he would have given you all a lift to the school” – He never used the police orderly for any household work, except to receive and take official messages. He too, never owned a house during his lifetime, but left a rich legacy. My mother too, lived a simple life. The fact that I remembered my own parents so much when I read this blog, is a testimony to the fact that whatever Mr.Bagchi told were universal truths, that they could evoke such emotions in others. Thank you, Mr.Bagchi for sharing this. Truly Grounded Inspiring Human Being, I would also like to know about Mr.Bagchi’s other sibling’s success stories as they too went through this same experiences.